“Here is your nose and here are your ears.” And on and on. But even these early communications with your child can use questions to involve him/her in the conversation. The response at first will be physical — a smile, pointing, looking up. Those early questions are more about just the facts, just labeling and identifying things. This is the first step in questioning. But we don’t want to stop there. 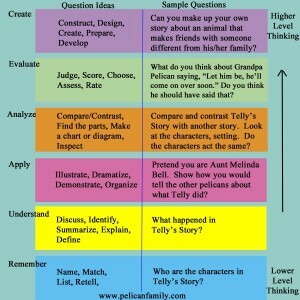 We want to change our questions to encourage our children’s thinking. Because, we want our children’s brains to grow and BLOOM. In 1956 a person named Benjamin Bloom, An American Educational Psychologist, worked with several other people to publish a work called the Taxonomy of Educational Objectives, which became commonly known as Bloom’s Taxonomy. “Taxonomy” according to Merriam-Webster.com means classification. The purpose of this was to train educators to help their students progress from lower levels of understanding up to higher level thinking skills. In Bloom’s Taxonomy the levels of dealing with information followed these steps, going from the bottom level 1 being the most simple up to level 6 being the most complicated. 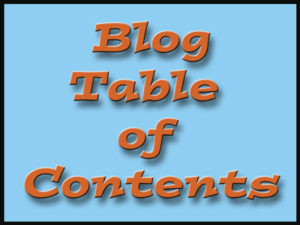 It is listed in this order to emphasize the idea that we start with a base of knowledge then move up higher and higher. They kept the first four levels the same, just switched the last two, and used different labels. This made more sense to me, as it seemed after one went through the process of getting new information, understanding what it meant, applying this information to a problem, analyzing the information to understand its parts and uses, then evaluating its usefulness to one’s own and other situations, then the next step was to take this information and perhaps change it or add to it to create something of one’s own making, something new and unique. That seemed to me to be the highest level. “OK,” you say, “I like that idea, but how do I do it? 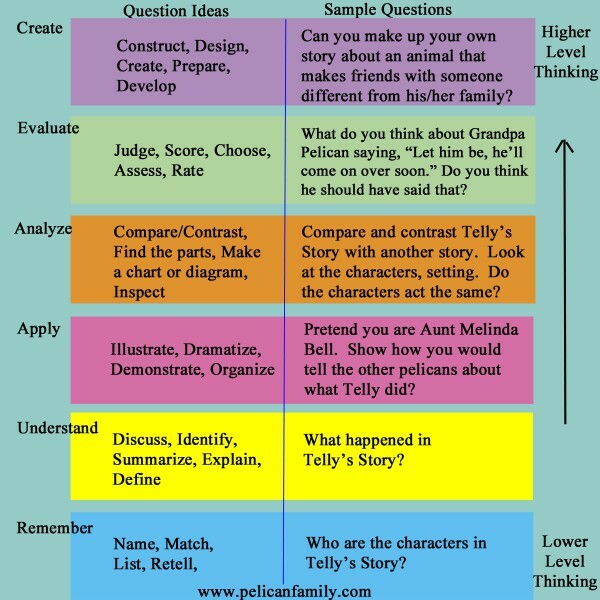 How do I know what to ask?” In the chart above we have put together some of the words used in asking questions at each level, and given sample questions about one of our books, Telly’s Story. You can use these ideas with other books or when talking about events or ideas with your children. There are many such charts on the internet. Type in Bloom’s Taxonomy charts for parents in Google images to see them. Many times we don’t get much beyond the first two lower levels of Bloom’s Taxonomy when we are discussing things with children. But children are great thinkers. They are excited about new ideas and different ways of doing things. Asking them different kinds of questions about what we are discussing might help them develop higher level thinking skills. If we encourage discussion and diversity in thinking, very soon they might be asking us questions that make us think! And while we are having these discussions, we are making connections with them that will last a lifetime. Listed below are some of the resources I found useful while reviewing the subject of Bloom’s Taxonomy.